Define your objective. Are you treating a specific health condition, concocting a home beauty treatment, dealing with an emotional problem, or a combination of factors. Decide which oils are most suited to your needs. Obviously you must choose between those oils you have on hand, and/or can afford. Essential oils are very versatile, and in general you can make substations among oils with similar properties and fragrances. If you want a room freshener that cleanses the air and uplifts the spirit, you could choose from any of the citrus oils (lemon, lime, orange, grapefruit, or bergamot. The differences between peppermint and spearmint are subtle, and will not be discernible to most. You may need to make other substations based on your budget, such as using rosewood or geranium in place of rose absolute, or cedarwood in place of sandalwood. It is also important to choose oils that appeal to you, no matter how well suited the oil looks on paper, if you don't react well personally to the aroma, it will not have the desired emotional effects. You will not want to make substitutions so freely in cases where you are treating a specific medical condition. Then the exact chemical components of a specific oil are of much higher importance. For instance, while all the citrus oils have antiseptic and antiviral properties, bergamot is considered a specific treatment of herpes and other virus conditions and will render the best results. You will find that the same oils can be used to treat any number of conditions, and that many different oils can be used to treat the same condition. Here is where you can use the notes of oils to guide your selection, perhaps choosing a top note for a fast acting effect, and combining it with a base note to prolong the effects. 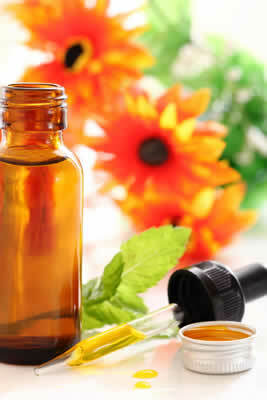 Most essential oils are classified as top, middle or base notes. This is especially relevant when blending oils. Top notes are highly volatile, they evaporated quickly and are very stimulating. Top notes are the first aroma you smell in a blend. Examples of top notes are Eucalyptus, Lemon, Orange, Mints, and Tea tree. Middle notes are more stable, and last longer. They are sometimes thought of as a "bridge" between the top and base notes of a blend. Examples of middle notes are Cardamom, Chamomile, Rosemary, and Pine. Base notes are the least volatile of the oils, and are used to "fix" the higher notes in the blend and prolong their fragrances. Base notes tend to have a relaxing, sedative effect, both sweeter and heavier that the other oils. Many of the base notes are resins like benzoin and peru balsam, or wood base oils like sandalwood and cedarwood. Examples of base notes are Frankincense, Sandalwood, Patchouli, Jasmine, and Angelica.